In Island Heat, a new online video slot, Novomatic takes you to the tropics! The inspiration for this slot game comes from the islands of French Polynesia. If you are a regular slot player, you’ll be aware that slot games are generally built around a theme. Fruits, ancient civilisations and the sea are all common slot themes. Novomatic’s most popular slots mostly fall under these categories. Players really enjoy: Book of Ra Deluxe, Dolphin’s Pearl Deluxe, Always Hot Deluxe, Sizzling Gems Deluxe and Aztec Power. This makes Island Heat quite a unique game. If you’re bored with all the normal slot themes, then play this awesome online slot! Journey to a new place with Novomatic by playing Island Heat. French Polynesia is widely regarded as one of the most beautiful places in the world. The islands are known for their tropical weather, their white sand beaches and their turquoise, clear waters. All of this can be seen on the reels of Island Heat and more! This online video slot is from Redline by Novomatic. It has 30 paylines that pay across 5 reels. 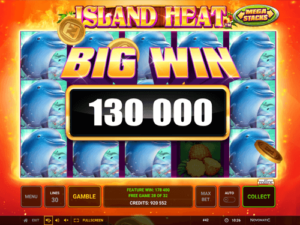 In Island Heat, you can win up to 32 Free Spins in one go! You will absolutely love the art and design of this game. When you open up the paytable, for example, you can see the beautiful tropical island behind you. There’s a volcano, lush greenery, a sandy beach and a calm, blue sea. A beautiful islander stands to the left of the reels. She’s absolutely stunning! She’s wearing a skimpy, flowery dress and she has fresh flowers in her hair. She’s worth journeying to this island for alone! We have already introduced you to the beautiful local woman, but that’s not the only thing for you to enjoy on this island. You can enjoy a bit of history and culture with the wooden Wild mask! This symbol stands out from the rest. The traditional wooden mask is surrounded by flowers and is carrying two torches. The Wild symbol awards wins for 2 or more matches. As usual, it can also fill in for any other symbol. The local beauty also awards wins for matches of 2 or more, and so does the dolphin symbol. These waters are full of friendly dolphins! Dolphins aren’t the only wild animal on this island. This island is also home to exotic parrots! This particular parrot is multi-coloured and pays for 3 matches or more. Payouts are also awarded for 3, 4 and 5 matches of the ripe pineapple, the local, tropical flowers and the card values. There are 30 paylines in Island Heat. They are not optional so they are always fixed. To make your bet at a level that suits you, you can set your bet per spin. By using the plus and minus buttons, you essentially reduce or increase your bet on those 30 lines. On the paytable, the win amounts are shown for your bet (they automatically update). Matches must fall on paylines from reel 1 and on adjacent reels to award the payout displayed. You can heat things up in Island Heat by gambling your wins. If you have auto on, your wins are paid into your balance; you have to stop auto mode to use the gamble feature. The hottest thing about Island Heat’s bonus is the bonus symbol. The symbol is a picture of a campfire, with the word ‘bonus’ written in flames. You will only ever see this symbol on the middle three reels (2, 3 and 4). Unlike in other Novomatic online slots, you need at least 7 bonus symbols to get the bonus feature. The bonus feature in Island Heat is Free Spins with mega stacks! 7 bonus symbols give 8 free spins. 8 bonus symbols give 16 free spins. 9 bonus symbols give 32 free spins! During the free spins, all of the symbols can turn mega stacked at any moment! When they land stacked, you could be winning on way more than one payline! In fact, you could win on all 30 paylines in just one spin with the mega stacked symbols. One of the best wins you could get in Island Heat is to have a mega stacked symbol cover all 5 reels in the free spins!